Here’s a question: is travelling in small-sized caravans still possible? A cursory glance through many caravan dealerships suggests no, from an availability point of view. However, a bit of tenacity will uncover some brand-new caravans under 5m (16ft 5in), for sale. Indeed, there are even some of shorter length, such as this Olympic Sprinter pop-top, which comes in with an external body length of just 3.91m (12ft 10in). There was a time when the majority of caravans were quite small, as compared to today, where many caravans are 7m (23ft) long and have a loaded weight of more than 3000kg. What changed both the length and weight in many cases, was the addition of full-sized bathrooms rather than just a porta-potti under the bed. 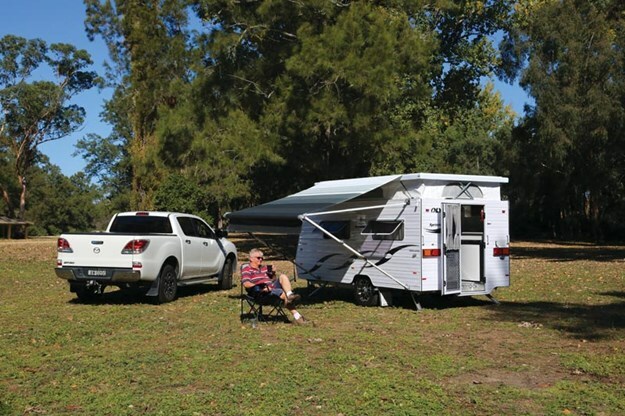 My Olympic Sprinter came from RV Connection at St Marys, NSW, and while I was there I had a quick look through a number of secondhand caravans without bathrooms and it is surprising what can be fitted in when there isn’t a bathroom. Designing a van less than 4m (13ft 1in) that is practical to use requires a few simple design tricks. 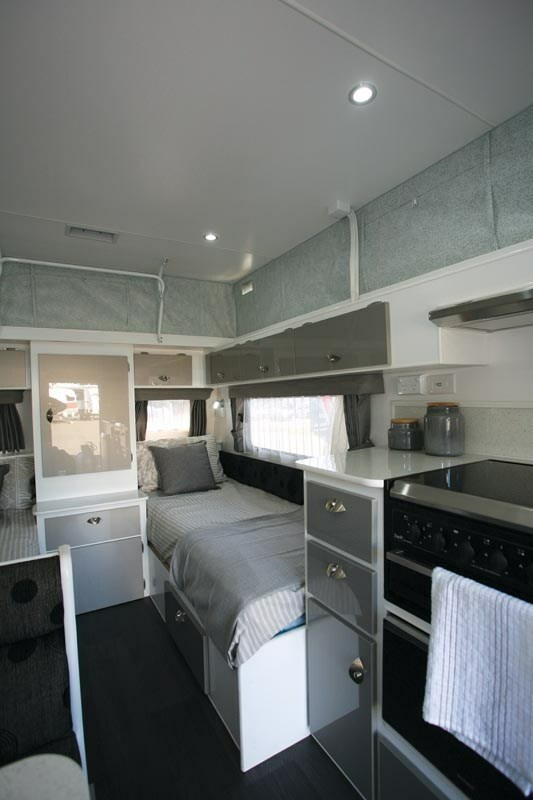 Although a double bed layout is available in the Sprinter line, this one has single beds and a rear wall habitation door. Both compromises have disadvantages but they are simple, effective space savers. The Sprinter really is designed for lightweight camping. Sure, it has a payload of 300kg but by necessity, general storage is limited. Setting up the little Sprinter van is a snack. Once unhitched, it’s a matter of lowering the corner stabilisers, unclipping the roof and setting the awning to the ‘open’ position. Lifting the roof from the inside is quite easy and once the gusset windows are unzipped, then it’s time to get out the camp chairs. I guess it’s a price thing but the corner stabilisers were the full wind-down variety, not the ‘quick drop’ that we have all become a bit used to! 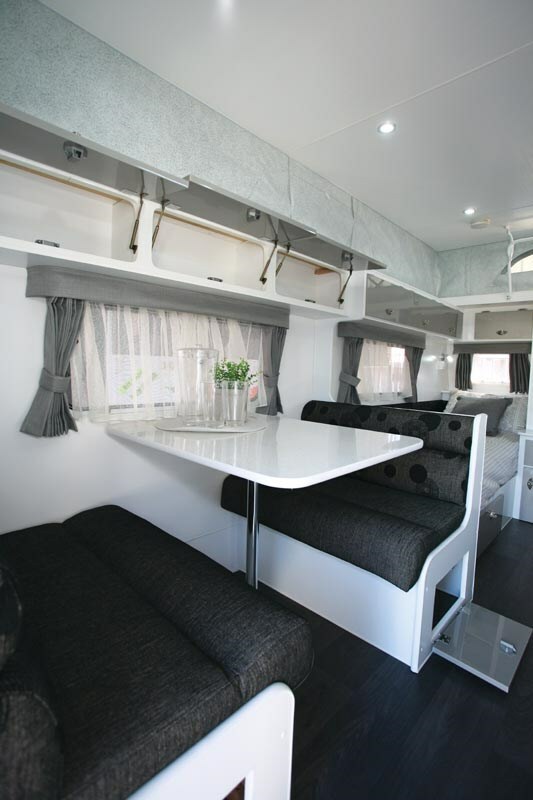 Overall, the internal layout is quite simple, with single beds occupying the front area and a nearside cafe-style dinette and offside kitchen bench filling the rear space. Up front, the single beds both measure 1.85m x 0.71m (6ft 1in x 2ft 4in). They are a mirror image of each other, having windows on the side and front walls and overhead lockers in the same configuration. In addition to the overhead lockers, there’s a central cabinet with hanging space and a mirror on the inside of the door, a single drawer and a cupboard below. Floor lockers on both sides give access to the under-bed storage. The Sprinter has standard features such as the four-burner cooktop and grill and stainless steel/drainer. 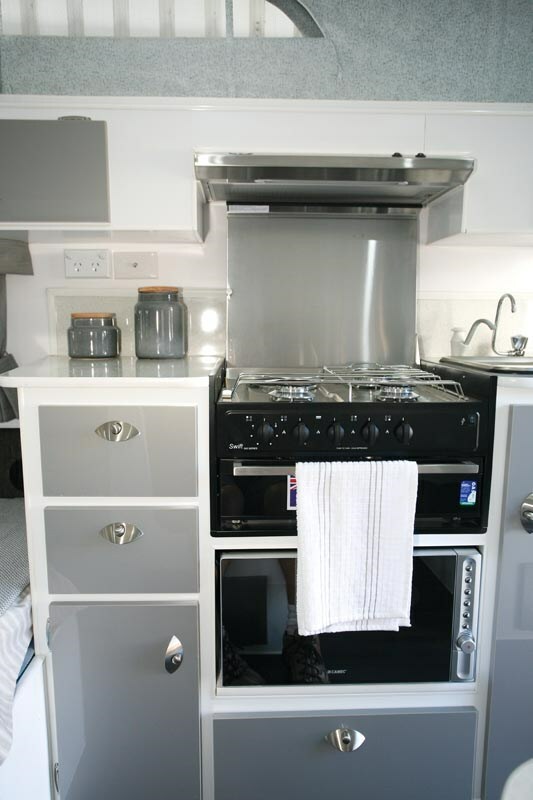 In addition, there’s both a 90L three-way and a microwave fitted underneath the benchtop. That leaves enough space for a couple of cupboards, two drawers and two small overhead lockers with the rangehood in between. I’m not a big fan of the drawer and cupboard latches used in this van. Mostly because I think they are a bit awkward to use for people with stiff or arthritic fingers. In many eyes, the 90L fridge might be on the small side but I’m thinking that most users of this van won’t be far from civilisation most of the time. An alternative is a small chest fridge in the tow vehicle for drinks, if nothing else. Like the beds, the dinette is just for two people and really only for dining. Certainly, this is a van for living outside most of the time but a benefit of single beds is that they can easily be used for day lounging as well. Floor lockers give access to the underseat areas and, like the bed and kitchen areas, there are small overhead lockers above. There are no surprises in the construction of the Sprinter, it’s all done very traditionally. Underneath there’s a DuraGal box section chassis with 100x50mm (4inx2in) rails and a water tank behind the beam axle. That latter item being fitted with simple leaf springs. 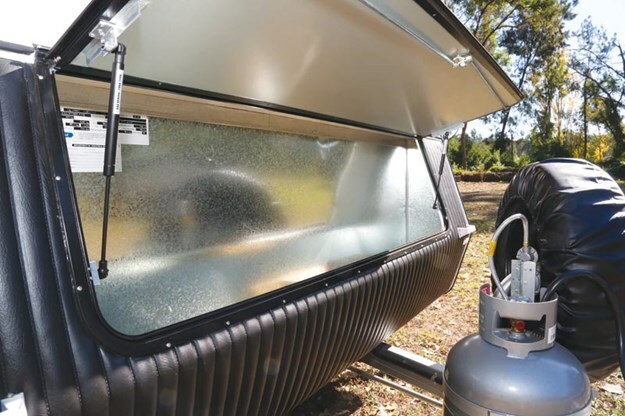 Above, the body has a Meranti timber frame, aluminium cladding and comes with a standard front boot. On the front drawbar are both a gas cylinder (9kg) and a spare wheel. Ironically, the spare being a standard on-road wheel and tyre is much easier to get off than some of the heavier offroad spares that are mounted at chest height on the rear bumper. If towing a large and heavy caravan fills you with caution, then this is a van for you. 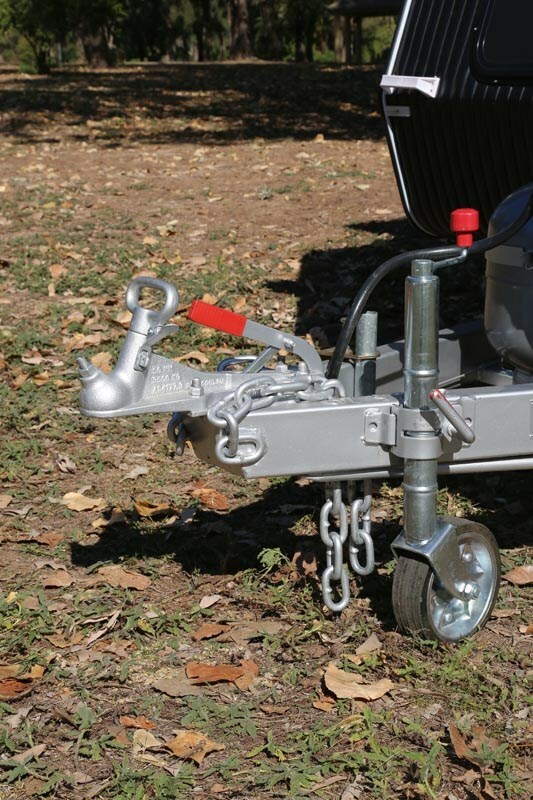 Its maximum loaded weight of just 1400kg makes it more than ideal for a number of tow vehicles. Indeed, it was well suited to my Mazda BT-50 tow vehicle. There is some controversy over the claimed maximum tow rating of 3500kg of quite a few manufacturers’ utes, but with this sized van, it was barely noticeable. One other benefit of the short, low height pop-top is that it’s very easy to park and store. I get that this van doesn’t have some of the expected mod cons, like an onboard bathroom. However, if you’re looking for a simple, lightweight van that’s easy to tow, quick to set up and reasonably comfortable, then it’s a winner. 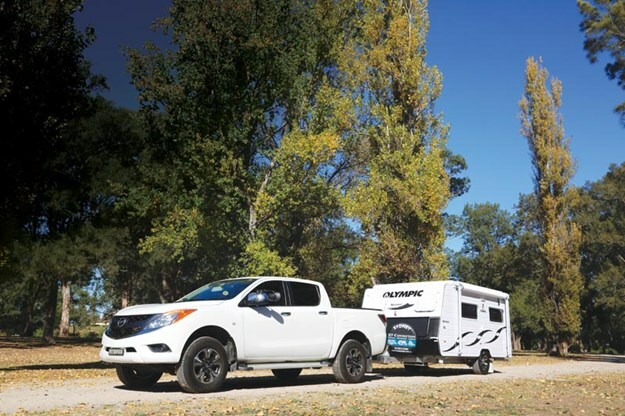 Best of all, you won’t have to go looking for a new tow vehicle, as the Sprinter’s ATM of 1400kg is suitable for any number of cars, people movers, little SUVs and utes. What more could you want?